In May, we were intrigued to learn that a futuristic eco-city was being planned for Fujisawa, Japan and last week we had the opportunity to speak with one of the people at the heart of this ambitious undertaking, Panasonic's Corporate Division for Promoting Energy Solution Business Director Haruyuki Ishio. 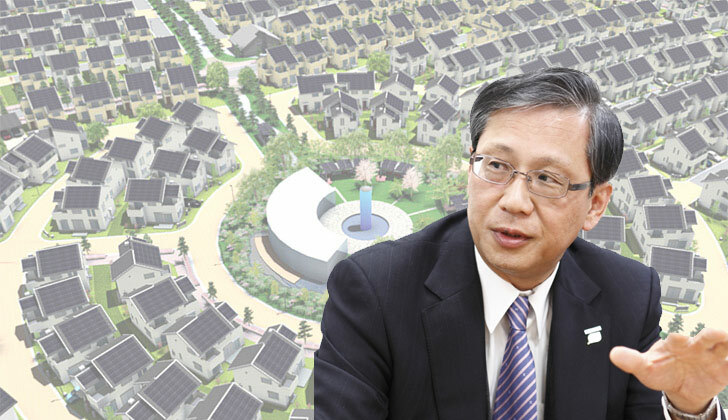 Prior to now, there had been a lot of buzz about Fujisawa Sustainable Smart Town, but very little available details, so we were excited to ask Mr. Ishio the questions on everyone's mind: How will the houses be powered? How much will they cost? Has anyone purchased any of the homes yet? Read on for Mr. Ishio's answers and ask any questions you might have of your own in the comments - we will pass them onto him and hopefully get responses for you! INHABITAT: Can you tell us a little bit about Fujisawa SST and what Panasonic is hoping to accomplish with this new endeavor? 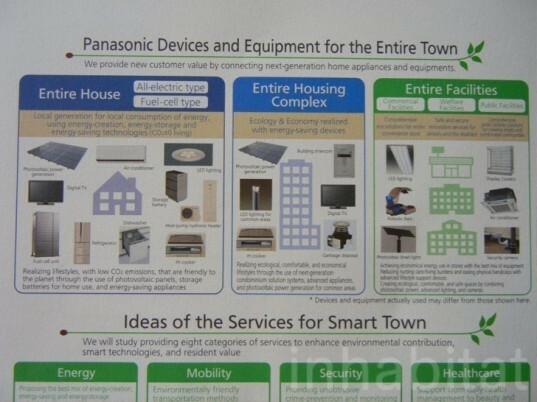 INHABITAT: When and why did Panasonic decide to create the smart town? Was it related to the disasters of last year? Mr. Ishio: In the beginning of 2007, Panasonic started to consult with Fujisawa City about how Panasonic could utilize the vacant land after we stopped production in our plants there. Fujisawa City focused on being an “Ecology-Oriented Town” in its city development strategy, while Panasonic has set its focus on becoming the “Number 1 Green Innovations Company in the Electronics Industry by 2018”. With similar overall aims in mind, Fujisawa City and Panasonic agreed to use the cleared land to contribute to society in terms of ecology. Fujisawa SST was planned before the massive earthquake that hit Japan on March 11, 2011, so the earthquake damage was not the direct reason for Panasonic to start this project. But the earthquake put the Fujisawa SST project into sharper perspective, making it evident how much safer and more sustainable such a community could be in an emergency. INHABITAT: How many homes will be in the SST and what will the layout be like? Mr. Ishio: It will be about 1,000 households in size. The town layout is based on a leaf-like pattern, and it features three layers of construction (as shown in the renderings we sent to you). INHABITAT: The town will be built on the site of an old Panasonic factory? How did you decide on this location? Mr. Ishio: Yes, Fujisawa SST will be built in the cleared site of a former Panasonic factory. 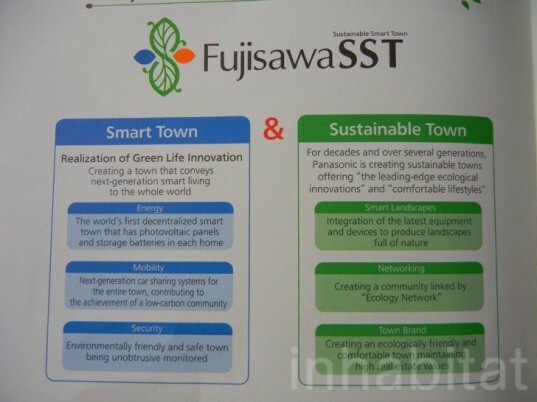 As we mentioned in answer 2, Panasonic decided to build the sustainable smart town there after consulting with Fujisawa City officials. INHABITAT: What types of renewable energy technology will be available to each homeowner? How much energy will those systems save for each household? standard feature. This is expected to generate approximately 4 kilowatts on average per house. 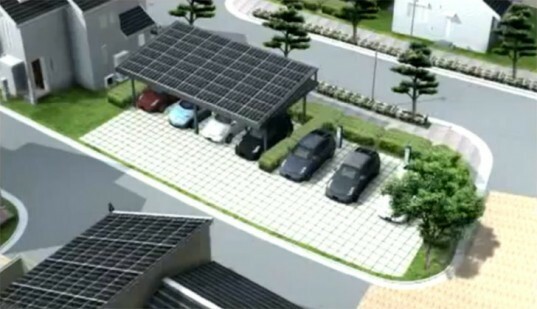 Within the project, Panasonic plans to install solar panels and storage batteries in all homes. Fuel cells are also an optional feature. Rough estimation of energy saving is 70% in each individual house and 20% in public space of the town. And the overall saving ratio as the entire town including each house and public space is 50%. INHABITAT: Approximately how much will each home cost? Fujisawa Sustainable Smart Town since home construction has not started yet. Also, home prices might vary depending on additional optional equipment. Note: We shared in our recent article about Fujisawa SST that comparable but non-eco homes in the Fujisawa area run for about half a million dollars. INHABITAT: Have you received a lot of interest from people who want to buy a home in Fujisawa Smart Town? Do you think the homes will be able to sell? INHABITAT: Would you want to live in Fujisawa SST yourself? Mr. Ishio: Of course, yes, I want to live in Fujisawa SST. I don’t think I could recommend it to our customers unless I had a strong desire to live in it myself. We would like to make it a town that anyone would want to live in. INHABITAT: What Panasonic electronics will be available in each home? Will homeowners be able to choose which electronics come with the house or will every house come standard with these devices? Mr. Ishio: Panasonic’s solar panels and storage batteries will be standard equipment in each home. Of course, homeowners are able to choose other brands for their other electronics. But Panasonic will do its best to make it attractive for consumers to buy and use Panasonic electronics for to enrich their lifestyles in addition to solar panels and storage batteries. INHABITAT: What part of Fujisawa SST do you feel still needs the most improvement? Mr. Ishio: At this point, we have no idea of what will need the most improvement. INHABITAT: What is the part of Fujisawa SST that you are most proud of? Mr. Ishio: Panasonic is proud of the following: We can showcase customers all of our home energy solutions including the home itself. We can show overseas customers the realization of the advanced smart house concept developed in Japan. We can demonstrate concrete proposals on several services to maintain sustainability in the home and town. it's interesting to here such information which leads to sustainable development. INHABITAT: Can you tell us a little bit about Fujisawa SST and what Panasonic is hoping to accomplish with this new endeavor? Mr. Ishio: From the business perspective, our Fujisawa Sustainable Smart Town plan is about Panasonic showing in a very visible way the company’s comprehensive solutions capabilities (for private homes, multi-family dwellings and facilities) in a real town setting, while establishing new business models for our energy solutions businesses. Mr. Ishio: In the beginning of 2007, Panasonic started to consult with Fujisawa City about how Panasonic could utilize the vacant land after we stopped production in our plants there. Fujisawa City focused on being an "Ecology-Oriented Town" in its city development strategy, while Panasonic has set its focus on becoming the "Number 1 Green Innovations Company in the Electronics Industry by 2018". With similar overall aims in mind, Fujisawa City and Panasonic agreed to use the cleared land to contribute to society in terms of ecology. Mr. Ishio: It will be about 1,000 households in size. The town layout is based on a leaf-like pattern, and it features three layers of construction (as shown in the renderings we sent to you). INHABITAT: The town will be built on the site of an old Panasonic factory? How did you decide on this location? Mr. Ishio: Yes, Fujisawa SST will be built in the cleared site of a former Panasonic factory. 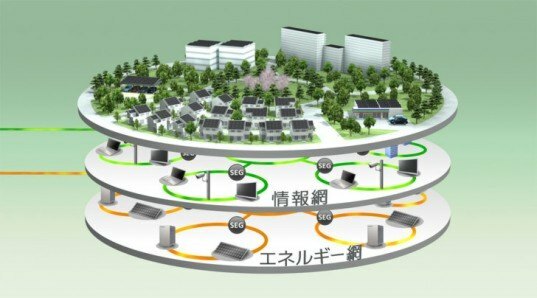 As we mentioned in answer 2, Panasonic decided to build the sustainable smart town there after consulting with Fujisawa City officials. Mr. Ishio: Power generation by solar panels will be available to each homeowner as a standard feature. This is expected to generate approximately 4 kilowatts on average per house. 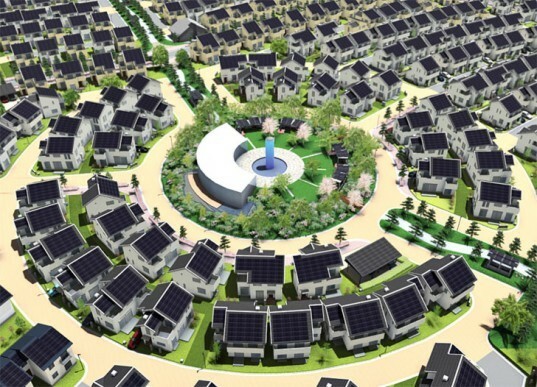 Within the project, Panasonic plans to install solar panels and storage batteries in all homes. Fuel cells are also an optional feature. Rough estimation of energy saving is 70% in each individual house and 20% in public space of the town. And the overall saving ratio as the entire town including each house and public space is 50%. INHABITAT: Approximately how much will each home cost? Mr. Ishio: Right now it's impossible to give you a specific price for each home in the Fujisawa Sustainable Smart Town since home construction has not started yet. Also, home prices might vary depending on additional optional equipment. Note: We shared in our recent article about Fujisawa SST that comparable but non-eco homes in the Fujisawa area run for about half a million dollars. Mr. Ishio: Panasonic's solar panels and storage batteries will be standard equipment in each home. Of course, homeowners are able to choose other brands for their other electronics. But Panasonic will do its best to make it attractive for consumers to buy and use Panasonic electronics for to enrich their lifestyles in addition to solar panels and storage batteries. INHABITAT: What part of Fujisawa SST do you feel still needs the most improvement? Mr. Ishio: At this point, we have no idea of what will need the most improvement. INHABITAT: What is the part of Fujisawa SST that you are most proud of? Mr. Ishio: Yes, Panasonic had many inquiries from consumers who are interested in living in Fujisawa Smart Town as well as from press people. In fact, some people made specific inquiries focusing on an actual purchase. We are fully confident that people will remain strongly interested and that we can sell smart town homes in Fujisawa. INHABITAT: Would you want to live in Fujisawa SST yourself?